Last week Geoff Newton had a small exhibition of Paul Yore’s textile work at his Melbourne gallery, Neon Parc. Yore’s work reminded me of the art of English Turner Prize-winning artist, Chris Ofili for there is the same intensity, insanity and psychedelic intensity of both of their vision complete with sequins and vibrant colours. It was a chance for Melbourne to see it before the work was due to go up to Sydney for the Sydney Contemporary, Sydney’s new international art fair. Keldoulis’s statement is overly definite (“no doubt”, “they are on the wrong side of it”) and at the same time vague (“various relevant provisions”). It implies that nobody at Sydney Contemporary had seen Paul Yore’s work before (very unlikely) and that censorship is “in the best interests of all the artists and galleries showing” (again very unlikely). We don’t know what issues Keldoulis “recognized” and why these same issues were not recognized when Paul Yore exhibited the some of the same work at Neon Parc, Ballart Art Gallery or the Melbourne Art Fair. The Crimes Act in NSW does refer to “blasphemous libel” but that was last successfully prosecuted in 1871. Blasphemy is not in the Crimes Act of Victoria and this might explain why there was no police raid on Neon Parc or the Ballart Art Gallery when one of the works removed from Sydney Contemporary was exhibited there. (Not that the Victoria Police regularly attend art galleries to check – they only do that when prompted by right wing scum.) I’m sure that Paul Yore’s work “Fountain of Knowledge” could be regarded as blasphemous libel (if you wanted to) but that would need to be proven in court. Keldoulis is libellous in claiming that there is “no doubt” that Paul Yore’s art is criminal. P.S. (20/9/13) Subsequent to publishing this blog post Keldoulis provided some degree of clarification as to what part of Crimes Act he was referring to. NSW has laws about the depiction of children. Arts Law website states: “As at 1 March 2013, genuine artistic purpose is no longer a defence to the offences of production, dissemination, and possession of material that depicts children pornographically.” Under this yet untested law “pornographically” is defined very broadly as “in a sexual context”. P.S. (29/9/13) Keldoulis and his legal team also removed the work of Queensland artist Tyza Stewart. Do the directors of art fairs normally tour the yet to be opened fair with a barrister to check if the art is legal? Or is Australia or Keldoulis abnormal? P.S. (2/12/15) To be fair to Keldoulis you can read his response my questions in a blog post: Censorship, Barry Keldoulis and Paul Yore. To be fair to Paul Yore in 2013 the Australian Classification Board classified Yore’s installation, Everything is Fucked as “Classification 1, Restricted, suitable for people over the age of 18” meaning that it is definitely not as Keldoulis maintained illegal. 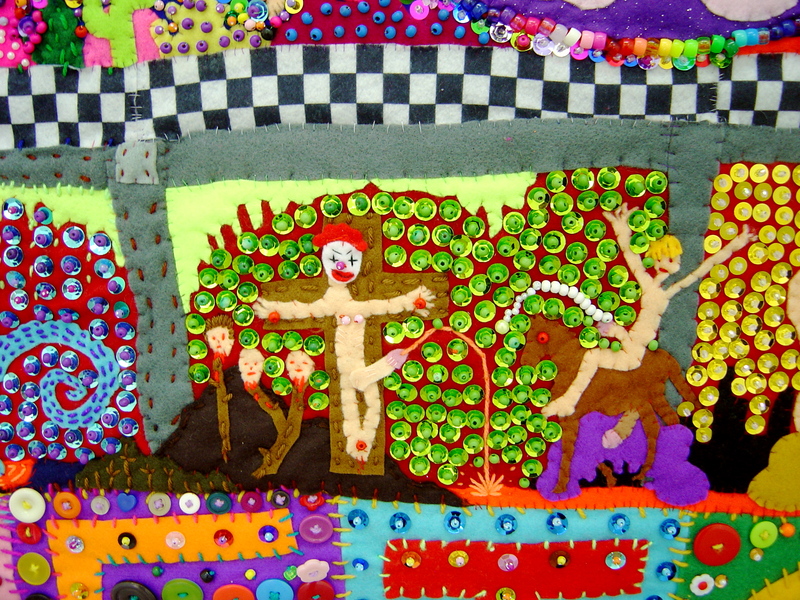 This entry was posted on Thursday, September 19th, 2013 at 5:49 PM	and tagged with Barry Keldoulis, Melbourne, Neon Parc, Paul Yore, Sydney, Sydney Contemporary, textile art and posted in Art Galleries & Exhibitions, Censorship. You can follow any responses to this entry through the RSS 2.0 feed. The Crimes Act in NSW does refer to “blasphemous libel” but that was last successfully prosecuted in 1871. ?? I think you may find the is a little out of date! Mike Brown Sydney 1966 Read on. A brush with Rebellion By Liza Power 12 November 2011 Sydney morning herald! Yes, it was probably the legislation that was passed in NSW after Bill Henson fiasco rather than blasphemous libel. Liz Power is right that Brown’s prosecution was because he was engaged in a civil liberties crusade rather than obscenity. Australia law does not tolerate civil liberty crusaders. I’m not a law historian Mark. All I know is Mick Brown is the only Australian Artist to be charged with Obscenity laws The Henson Fiasco was more recent and he doesn’t have a conviction against his name. All that aside what do think of Barry Keldoulis becoming the new leader of the Arts Party? In politics, you do well if you run with the fox and the hounds! Point taken, Henson and Paul Yore don’t have convictions, the attacks on them are rear-gaurd actions. I haven’t heard anything about the Arts Party but I wouldn’t trust Keldoulis with my civil or human rights.